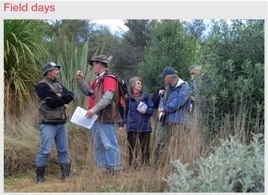 NZ Farm Forestry - Are we still planting cypresses on the right site? Patrick Milne, New Zealand Tree Grower February 2006. There is increasing interest in cypresses as alternative softwood species for plantation forestry in New Zealand. While cypresses as a whole will grow on a very wide range of sites, there is considerable variation in site requirements between the species. Unlike radiata which survive and grow on nearly all sites, cypresses are quite demanding in their site requirements. The 2005 planting season is now well behind us and for the great majority it will have been another successful year. Following on, many growers will now be starting to look forward and plan 2006 plantings. With this in mind, I think it is prudent to review the siting requirements for those cypresses commonly planted by farm foresters and ask the question – are we still planting the right species on the right site? Macrocarpa, the best known cypress has been grown in New Zealand for almost 150 years, mainly in shelterbelts. Many of these older plantings have been harvested and processed into wood products which are acclaimed nationally and internationally. We have all seen and heard these stories which have fuelled the continued planting of this species. As with most good news there seems to always be a downside, and with macrocarpa it is cypress canker. As a general rule macrocarpa has performed best in the cooler regions of the country, principally but not exclusively the South Island. Anecdotal evidence suggests that during the last 10 years the incidence of cypress canker has been on the increase and many areas that were once considered prime macrocarpa sites are now marginal, and for some it is no longer an option. There have been many hypotheses suggested for this apparent increase including changing climatic factors, the influence of planting stock genetics, planting off-site, a general increase in inoculum loadings as a result of increased plantings and possibly a change in the virulence of cypress canker. It is likely to be a combination of these factors as opposed to any one in isolation. The Canterbury experience is that canker increased slowly during the last 15 years, it was not something that happened overnight. This has resulted in a slow realisation or acceptance of its significance. Infections in stands tended to be dismissed along the lines that it was only a few trees and will not have any impact on the final crop, or that the trees will grow out of it in five to six years. The situation is further complicated by the fact that there is a paucity of data on the ecology of cypress canker and its interaction with stand management practices. It is important to remember that macrocarpa is one of the most susceptible species to cypress canker and anything we can do to prevent infection may only be a reprieve in the short to medium term. Today it is difficult to know what is a good macrocarpa site or where one should plant the species, and this has been reflected in declining planting rates. Lusitanica has always been considered a species to be planted in the warmer moister regions such as much of the North Island, parts of Marlborough and Westland. It has not been widely planted in the past in those areas considered good macrocarpa regions, as they were often considered too cold or exposed. While lusitanica is intolerant of salt winds and exposed sites that are drought prone, it appears to be almost as cold hardy as macrocarpa. In a trial on Ken Stephens property at Balclutha the growth of this species has been surprising. 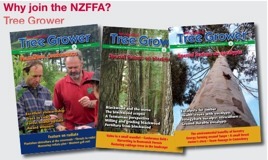 Results from this trial at age seven years indicate that while the mean height growth is on a par with macrocarpa, mean diameter growth is 11% greater. This is encouraging, as it offers a possible alternative to planting macrocarpa on these sites. The good news is that lusitanica appears to be more site tolerant than was envisaged in the past and as such is a realistic alternative to macrocarpa on many sites. Not much has changed amongst the other cypress species sometimes planted, Cupressus torulosa tolerates very dry sites with good form, health and timber, but is slower growing. C. arizonica is very site tolerant and is an effective shelter species, less favoured for timber. Chamaecyparis lawsoniana was once widely grown as a shelter species is now restricted to higher altitude, cooler, fertile sites by cypress canker and a needle cast fungi. The cypress hybrids, namely the Leylands and Ovens cypress are gaining in popularity. They are proving to be a reliable choice for those sites once considered good for macrocarpa. Ovens cypress is proving to be a healthy, vigorous and adaptable clone that grows very well throughout most of the country. It is growing in trials from Northland to Invercargill and indications are that it is probably the most adaptable cypress variety currently available for planting. Having said this, it is very intolerant of hot, dry or exposed sites and salt laden winds. There is more on these hybrids is in this article. In summary, macrocarpa is being increasingly regarded as a marginal proposition for most sites while the range of sites suitable for planting lusitanica is increasing. The cypress hybrids are being planted on an increasing range of sites and offer growers further choice. Patrick Milne is a forestry consultant with specialist knowledge of cypresses.